Most of the books I read send me into throes of euphoria or antipathy. Either way, I tend to feel passionately about books, which is the point: to feel. I love or hate the characters; feel compelled to rant or rave about the writing in another review. 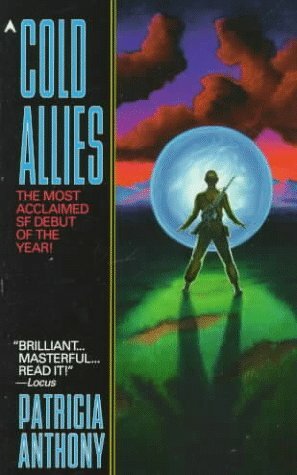 Patricia Anthony’s Cold Allies left me feeling rather indifferent and almost palpably relieved that I could go on to the next offering in my menagerie. I even delayed writing this review, because I just don’t really care about this book or the cardboard figures who populate it.The PlotThe Earth is engaged in World War III. Western Europe and the United States form the Allies at war with the ANA (Arab National Army? ), a Confederation of Muslim/Arab states. What are they fighting for? Food. Global warming and the greenhouse effect have expanded the deserts, dried up the Midwestern United States, and created a shortage of food. The Chinese, supposedly, quietly starved to death. The Arab states decided to wage war against Europe (who was not starving quite as quickly). The US is involved in the war, but has it’s own on-going famine on the home front.Enter the aliens. The aliens appear as blue lights that hover over battlefields, numbing the wounded and retreating personnel with their coldness. When the corpses are recovered and taken to pathologists, both the Allies and the ANA have the same findings: something is neatly finishing off the mortally wounded. Something is also saving lives too. Generals on both sides want to harness the aliens’ power for themselves (as well as just figure out what it is), or fool the other side into thinking they have done so.Elements of StyleI found Ms. Anthony’s writing style too disorienting for my taste. She throws the reader into the middle of the action and expects us to piece together the story as to why the nations of the Earth are engaged in World War, who is on which side, where the aliens came from and why they seem curious about some people and not others. While I have often admired authors who use this style to build suspense to a final climax, Anthony does no such thing. A simple prologue would have cleared up some of the confusion in this book. For such a short book (298 pages), Ms. Anthony introduces a slew of characters and locations—some related to each other, others not at all: General Lauterbach, American; General Baranyk, Ukranian Army; General Sabry, ANA; Colonel Wasef, ANA; Lieutenant Justin Searles, American Navy pilot; Dr. Beaudreax, American Reserves pathologist; Sergeant Gordon Means, American remote control robot operator; Mrs. Parisi, writer of UFO books; Jerry, the homeless kid. At one point or another, all of these characters are the main protagonist of several sections, along with other minor characters. Anthony spends so little time with each that I failed to sympathize with the majority of the characters. They are one-dimensional and stereotypical, and quite a few of them are completely superfluous to the storyline. By the end of the novel, I didn’t really care what happened to them.Random NitpicksMany of the characters in Cold Allies are in one country’s military or another. I am not knowledgeable enough about the protocol practices of other nations’ armies to comment, but Ms. Anthony does not accurately portray the way the American Army operates, how peers and subordinates relate to each other, tactical conduct, etc. When I read science fiction books that take place in outer space or on other planets, I can suspend my disbelief and just take the military strategy and practices at face value. I am much less accepting of books that take place on Earth in the seeming present or near future, that bastardize the military practices and strategies with which I am familiar. Acronym etiquette requires spelling out the terms used the first time with the acronym immediately following in parentheses. Ms. Anthony employs acronyms throughout the book, many of which she does not bother to spell out or explain.OverallIf this book is speaking to the reader, it’s on a frequency I don’t hear. This novel is more suited for the hard-core science-fiction fan who doesn’t mind military discrepancies, faint characterization, or not knowing a historical context. Considering the amount of vulgar language and situations, this book is not suitable for teenagers or children. This book is great in the same way a bad B-movie is great; It's terrible, but its terribleness is inherently enjoyable. Anthony's choices are sometimes so bizarre, the real mystery in the book is what kind of drugs she's on. Why is there this weird love subplot between the General and the doctor who is removed from the main plot almost immediately after she is introduced? Why is Dee introduced as a character at all if she's just going to be killed immediately? Why is there a Zen master talking with a weponized video game nerd? I really enjoyed reading this book, but I can also completely understand the low scores some other people have given it. In a word: silly. In another word: boring. Maybe it was my mood of the day. Maybe it's because I've been reading so many excellent military sci fi books lately. Whatever the case, when I started reading this book, I was immediately put off by what seemed to me to be the author's lack of knowledge and professionalism. Further, the book didn't seem as realistic as I want my military sci fi to be. Wait. Let me back up. Some of it actually was. A future Earth, suffering from easily believable accelerated global warming that has so increased the rate of desertification that the Arab world, faced with starvation, has created an Arab National Alliance army and has invaded Europe. The European forces are a nervous group of Russian, Ukrainian, Pole, German, and other European countries, with the US as a hesitant ally whom their partners worry might pull out at any moment, as things aren't going very well over there either. Enter one Sgt Gordon and his CRAV, the first real futuristic weapon in an otherwise boring book of near-current twentieth century weaponry. The CRAV is a VR controlled mini-tank that is a reconnaissance and attack vehicle. Gordon is attached, seriously attached, one could say in love, with his. And while his is out surveying dead bodies one day, fa, la, la, he spots a floating blue orb coming toward him and wonders what it is. Then he is ripped from his VR equipment and suffers a near breakdown.That's about all I could take. It was frankly pretty laughable. The floating blue orbs are aliens who appear on both sides and you don't really know if and who they're fighting with or for. You do know that after they've been somewhere you find dead bodies with puncture wounds and bodies drained of all fluids. So they're vampire aliens. Yep.This book has a really low rating on Goodreads. That doesn't necessarily mean it's bad. I've read some poorly rated books and enjoyed them. However, I just didn't think this would be one of them. I was laughing too hard in serious spots. I couldn't take it seriously and it wasn't remotely believable in parts where it was desperately trying to be. Maybe I'm being too critical. Maybe I'm unfairly comparing this book and this author with some of the best military sci fi writers out there. But if you're going to write in that genre, shouldn't you strive for the best, to be the best, for the best book? Do you want to pump mediocre, at best, crap out there just for a couple of bucks? I don't think so. I read the first several chapters and gave up. One star and not recommended. It's a battlefield; it's war. It's robots in the field being operated by a guy in virtual reality gear, sending the robot up steep ravines to spy out the enemy's rocket launchers, to find and destroy the equipment that is about to bring down the remaining spy satellite. Gordon is good. His roobt has found a number of bases and destroyed all but one of the enemy's launchers. He steers his robot like an old friend, hides it in barns or under leaves when he needs to take a break.Right now, Gordon is in chair, and his CRAV (robot) is ambling through a field of dead bodies. A dog barks; he turns the robot and sees a neon blue light, so subtle he almost misses it. It's the only thing moving on the field. The dog has already run away. "Arm missiles" he screams but a voice outside his helmet shouts: "dont' fire! "They pull him out of the CRAV, too abruptly. "Print that." says his commander. Gordon's too dazed to understand what is happening, but know the eerie blue glow is about to change the battlefield. He just doesn't know if that's good or bad. Mysterious blue orby aliens haunt earth as the planet experiences a great war. These aliens seem to have taken a particular liking to certain humans--a woman who falsely claims to be in contact with them (the "Eridians"), a young man who remotely pilots his CRAV--and perhaps even take a sinister interest in them, as they whisk these chosen humans away to another reality. Red Storm Rising meets Close Encounters of the Third Kind. Aliens appear in the midst of World War Three. The problem is no one knows whose side they're on.